Although everybody knows that breakfast is the most important meal of the day, it can be tough to get a fast and healthy breakfast when you’re constantly battling a busy schedule. The instant breakfast drinks in our selection give you the boost of energy that you need without running the clock. Our cases of wholesale Carnation shakes are perfect for hotels, traveling businesspersons, athletes or anyone with a tight schedule and an empty stomach. Nestle Carnation Instant Breakfast French Vanilla Beverage - 1.26 Oz. 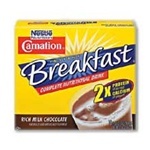 Nestle Carnation Instant Breakfast No Sugar Added Chocolate Drink - 0.69 Oz. Nestle Instant Breakfast Chocolate Powder - 1.26 Oz. Nestle Carnation Instant Breakfast Strawberry Powder - 1.26 Oz. Instant breakfast shakes are great to buy in bulk because they can last you months without going bad. Because breakfast mixes don’t need to be refrigerated or kept frozen, you don’t have to worry about taking up room in limited storage areas. They’re great to keep as an alternative to breakfast, and your customers will be grateful to have healthy shakes as a convenient option available to them. We offer some of the most popular brands such as Carnation instant breakfast by Nestle, and quality is never a question when you buy from us.